Purchase your tickets in advance online: doing so completely eliminates your wait at the box office. It is also the ONLY WAY to GUARANTEE your entry into Brighton Asylum. 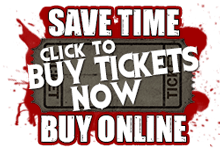 With advanced tickets, you are always guaranteed to get into Brighton Asylum, even on sold out nights. Purchase a General Admission Timed Ticket. Reserve your time block and go directly to the appropriate time slotted general admission queue line. Due to the timed nature and limited capacity of these tickets, they frequently sell out, so don’t wait. (Please do not arrive earlier than 30 minutes before the time printed on your ticket. As doing so will only extend your wait time.) Please allow extra time for parking. We offer free on-site parking. So as an example, If your time reads 8pm on your ticket, this means that you would ideally enter the attractions sometime between 8pm and 9pm, a 1 hour window. It does not mean you enter the attractions at 8pm. Please note: With this ticket, you will still wait on line. This is not a “skip the line” ticket. This is a general admission timed ticketing strategy aimed at wait reduction by staggering ticket sales. If you purchase an 8pm ticket, you will enter the attractions before everyone who purchases a 9pm and 10pm ticket, even if they arrive before you. Although every effort is made to get everyone inside the attraction within their 1 hour time block, it is possible that there could be extended wait times on busy Friday and Saturday. Regardless, this system saves many hours over a traditional “first come first serve system”. IF YOU DO NOT WISH TO WAIT, PURCHASE A FAST PASS. Purchase a Fast Pass Ticket. There is little to no wait with this ticket. Reserve your time, check in at the Fast Pass entrance, and your group will skip the general admission queue lines and go right to the “pen” process for entry. Wait times are typically 5-15 minutes as opposed to 1hr+ on the general admission queue lines. You will only wait for the pen process and other fast pass guests, which is similar to how a roller coaster is loaded. Due to the timed nature and limited capacity of these tickets, they frequently sell out, so don’t wait. Return and Refund Policy: All ticket sales are final. No refunds, returns or exchanges. No refunds of service fees. We do NOT close if it rains. Our queue lines are held outdoors under weather protected structures. Dress Warm and prepare for a night of thrills, scares, and adventure!